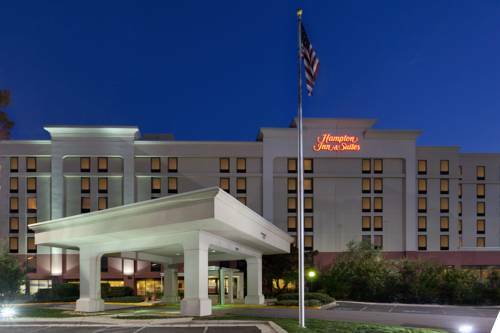 The Hampton Inn Alexandria-Old Town Area hotel is located seven miles south of Washington DC on Route 1 /Richmond Highway/ 1/4 mile south of Virginia Interstate I-95/495 Interchange and one mile south of historic Old Town Alexandria Virginia. Our hotel offers 24-hour shuttle service to and from historic Old Town the Metro Station and Reagan Washington-National Airport. The Hampton Inn hotel in Alexandria Virginia offers 213 spacious guest rooms of which 57 are studio suites featuring hairdryers coffeemakers complimentary high-speed Internet full-size iron and ironing board and TV with cable microwaves and refrigerators. Hampton Inn Alexandria-Old Town Area hotel guests enjoy amenities such as complimentary breakfast bar featuring hot items an outdoor pool fitness center gift shop connecting rooms laundry/valet services and cribs. To make your visit to Alexandria Virginia more comfortable we also offer guest laundromat meeting/banquet facilities and audio/visual equipment. We love having you here in Virginia at the Hampton Inn Alexandria-Old Town Area hotel. All reservations must be guaranteed with a major credit card or adv cash deposit to hotel regardless of time of arrival. All reservations must be cancelled by 24hrs prior to host time unless deposit required. Policy subject to change. all reservations must be cancelled by 24hrs prior host time unless deposit required. if this reservation has been made electronically please cancel it electronically to avoid confusion and a no show bill. policy subject to change. Historic home, museum, and grave of the Father of Our Country. See his false teeth and his bed of death. Seesaw battle with Graceland as the most visited private home in the USA.